Kansas player's uncle is the ultimate March Madness fan - trendistic.com: ever tried. ever failed. no matter. try again. fail again. fail better. This is the world’s proudest uncle. University of Kansas guard Wayne Selden Jr. certainly has a lot of fans, but none more passionate than his Uncle Anthony. 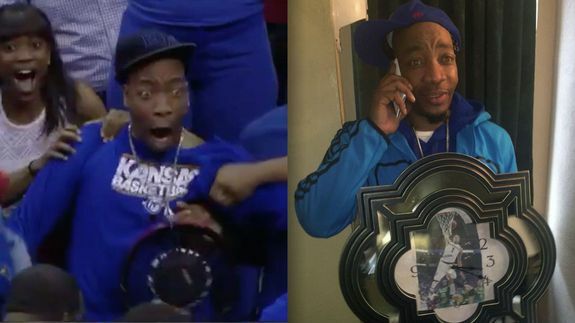 Anthony Pitts Jr. has taken on the role of big-clock-wearing hype man for the Jayhawks throughout the Big 12 tournament. Whenever Selden makes a great play, Uncle Anthony goes absolutely wild in the stands.